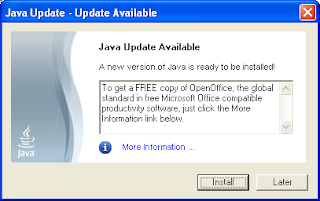 This morning "Java Update" (Java Control Panel) told me there was a new version of Java available and it also contained an advertisement for Open Office! Perhaps Sun has been doing that for a while but it was the first time I noticed it. Too bad it is not smart enough to tell I already have it installed. For the last year and a half I have been working hard at a technology start-up company outside of Boston called Zeetoo. The first product will be the Zeemote (pictured above). 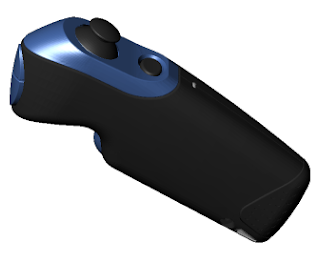 It is a very small one handed wireless joystick that makes playing games on your cell phone much easier and much more fun. Phones today are coming with more and more processing power and are starting to support advanced features such as 3D graphics. The big limiting factor now with mobile gaming is the user interface. Users are still required to control the game by hitting buttons on a phone key pad. The Zeemote changes that. Play becomes more natural, intuitive, and enjoyable. I saw Jeff Bezos on Charlie Rose last night. 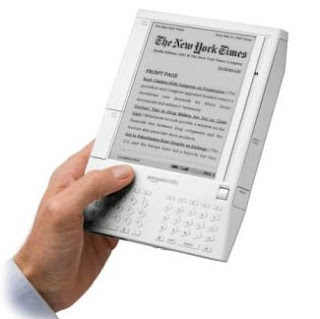 He was pitching Amazon's new e-book reader called The Kindle. It is like many of the e-book readers that have come out in the past but adds some great features that I think could finally be the breakthrough needed for the e-book business. This thing looks amazing. Go check out the video on the Kindle site. The feature I'd most kill for: Access to Google Reader! Charlie tried to draw parallels between what the Kindle was attempting for books with what the iPod did for music. We'll see. I went to Toys R Us last night to go birthday shopping for my 4 year old nephew. This season he is interested in everything Star Wars. So I went right to the blue section of the store and found the Star Wars aisle. Right away the "Force Fx Lightsaber" caught my eye. It was a "realistic looking" lightsaber in a large protective glass case. A big red button was exposed that said "Try Me". 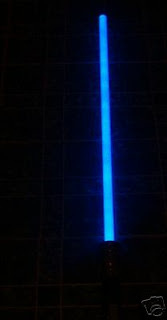 I pushed it and the saber's "blade" lit up and the exact sound from the movies came roaring out of it. I'm not a Star Wars fan at all but I have to say it was very cool. They have different designs / colors for each of the main characters. It was "on sale" for $99 which was down from $120! The box said "not a toy" on it and specified that it should only be used by those 12 and up. Sorry Jack, I don't think you are ready for this one. I almost bought it from my brother instead. Google finally announced its plans for the mobile: Android is a complete and open software stack and SDK for mobile devices. It is based on top of Linux and all applications will be written in Java language syntax. I say "Java language syntax" because ultimately the code will be converted to and run as Dalvik virtual machine bytecode (as opposed to Java bytecode) and is optimized for the ARM processor. The Android co-founder claims that this will allow applications to run up to 10 times faster. Interestingly Android will not comply with J2ME but will instead be based in part on Apache Harmony which strives to be an open source implementation of J2SE. It continues to amaze me how companies like Apple and Google are jumping into the mobile space and so quickly making such impacts. Just saw the following commercial for Verizon's Samsung Juke. Introducing the Juke by Samsung, exclusively by Verizon Wireless, an ultra sleek mp3 player that flips into a phone. That is the first time I've seen Verizon, or any other phone company besides Apple, market a phone as primarily a music player. Phones have been able to play music for a long time now but the traditional phone companies have done such a poor job educating consumers and making the feature easy to use. I'm happy to see Apple is forcing them to evolve.